Shown here is an original map from the Atlas to Accompany the Official Records of the Union and Confederate Armies, published by the Secretary of War, unquestionably the most complete set of accurate maps of the Civil War ever published. The title of the atlas appears in the top left area and plate number in the upper right, a date of 1860 is printed on the map. A copy of the title page is also included with all the publishing particulars for genuineness. The atlas was distributed in a very limited context to be distributed to government officials in the three houses of government as a reference for assessing the Civil War. This is from the original first publishing that lasted from 1891-1895. This very detailed and remarkable map shows forts, wagon trails and routes. Idaho is actually labeled as Washington Territory and Arizona is still part of New Mexico Territory. This map is available on eBay with a buy it now price of just $149. 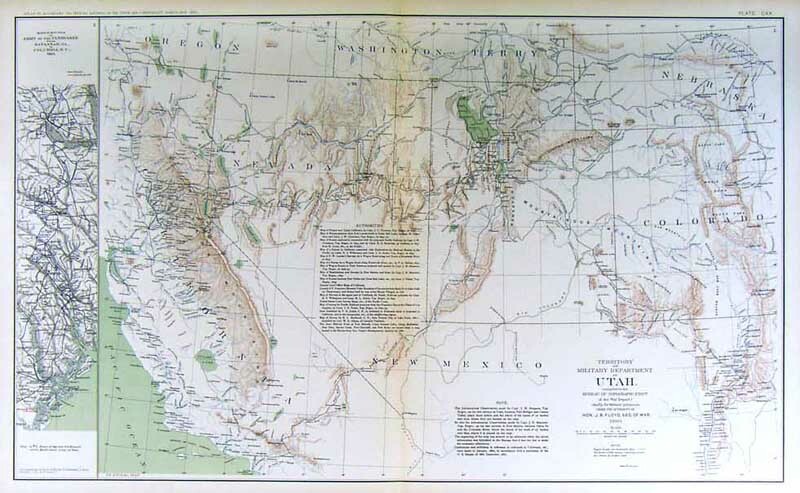 Take a look at some more antique maps to start of complete your collection. Here is an amazing set of antique books about the wild west. 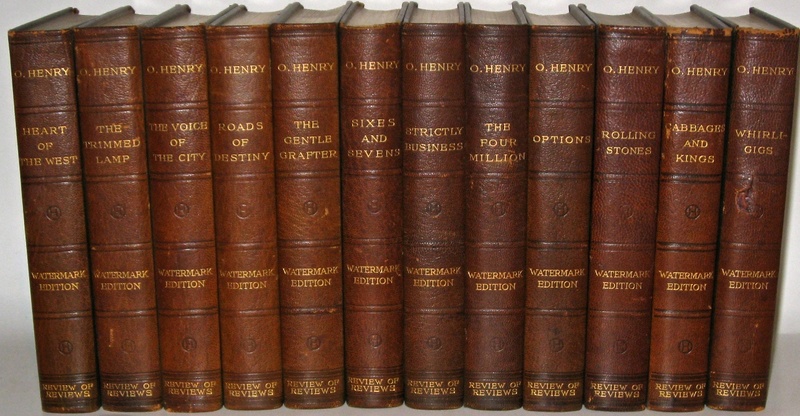 O’Henry’s brilliant works presented in gorgeous leather bindings. Extremely well preserved. Each volume contains a frontis protected by tissue and several plates. This set is available on eBay with a buy it now price of just $875. Also make sure to take a look at some more antique books from the wild west era. Pictured here is an original oil on canvas painting by Santiago Perez. 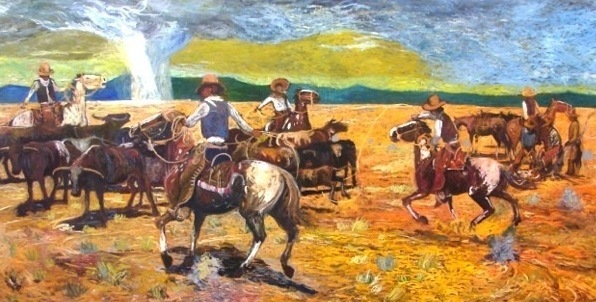 This painting which is titled “Round Up” is signed and dated on veso. The painting is very large at 54″ H by 112″W. This appears to be a pretty rare find a of such a Old Western painting of this size by such an accomplished artist. “Round Up” is available on eBay with a buy it now price of $12,499 or best offer. Santiago Pérez is an artist living near Tijeras, New Mexico, was born in San Antonio, Texas and also lived in many small towns around the south Texas area. 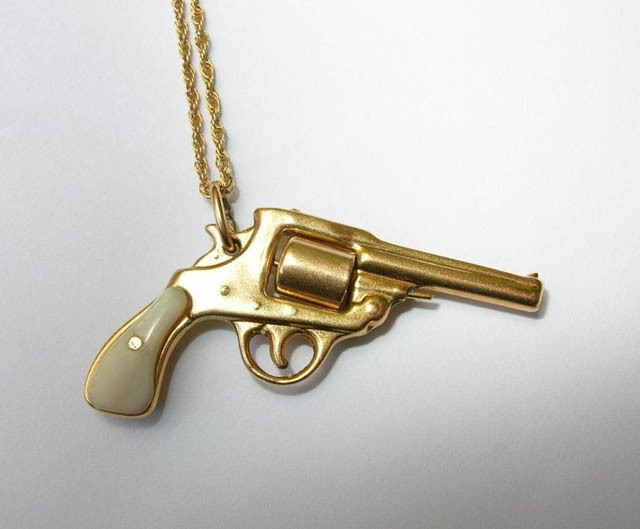 Santiago’s artwwork has been purchased by several corporations and many individuals throughout the United States. He is represented by the Sandy Carson Gallery in Denver, Victoria Boyce Galleries in Scottsdale, A Muse Gallery in Columbus, Ohio, Nuart Gallery in Santa Fe, and the Bison Legacy Gallery in Cody, Wyoming. Stimulated by his family and an artist uncle, Santiago performed drawing and painting, learning mostly by copying from TV cartoons, horse and wildlife magazine, and children’s books on the West. He was an elementary school teacher for a brief time, illustrated children’s materials, and then served in the Air Force for 24 years. He pursued his art interests, practicing figurative drawing and painting, as well as immersing himself in art history. Santiago first exhibited his work when the Air Force stationed him in West Berlin, and he continued to develop his painting in Colorado Springs, Pueblo, and Denver, Colorado. The attractive Colorado terrain inspired Santiago to develop into a landscape painter working in numerous styles and approaches, from naturalist to symbolic/abstract works. An enthusiastic student and open to many forms of creative expression, Santiago also painted on metal, made cutout painted forms, and installed several thematic environments. Take a look at some more Wild West paintings. 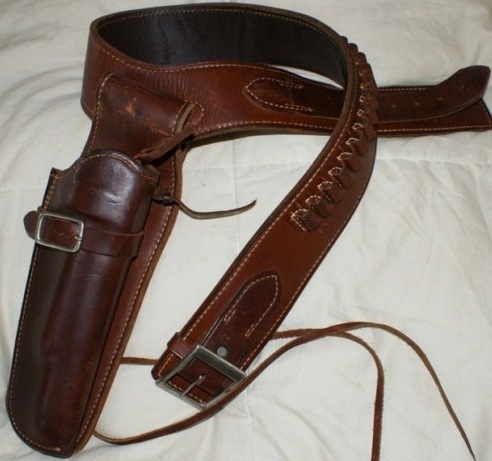 Here is a hard to find Howard Council calf roping saddle that was produced around 1973. Howard Council Is an artisan who has been custom saddles Since 1950s. Howard is now 84 Years old and while he is still producing saddles at his shop in Lawton Oklahoma, he stopped taking orders a couple years ago and will just fulfill his last remaining orders. This saddle has Floral Tooling On The Skirts, Pommel And Fenders, a 15″ padded suede seat and the fleece appears to be in top condition. 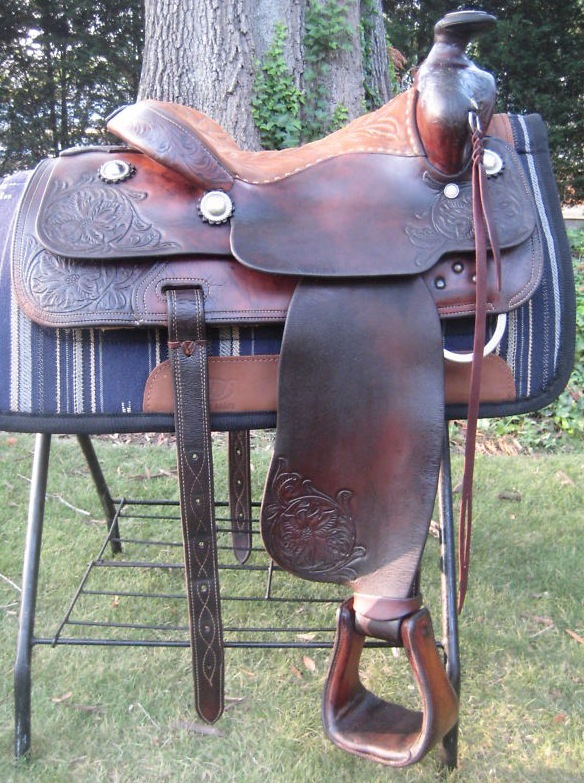 This saddle is available on eBay with a buy it now price of $3,995 or best offer. Take a look at some more vintage saddles.